Having very much enjoyed the wood fired pizza and bruschetta on our first foray to Napoli a few weeks ago (new pizzeria at 30 Courtenay Place between Allen and Blair), we decided on a Friday evening return with a friend to see how they were faring. The café has a delightful mural along one wall, welcoming staff, and does feel like you could be somewhere in the mediterranean. Nice to be able to step in off the street and be transported so easily. Two pizzas between three of us was sufficient (a capricciosa and a contadino), with a couple of pleasant montepulciano and chianti’s to round out the experience. The pizzas here are thin crust with a light airy puffed edge and the toppings are not stinted on, whilst still kept light and fresh. There are a range of fresh pastas and salads to complement, or for those who are not pizza fans (really, do they exist?). On this occasion the pizza bases felt a little too soft and didn’t hold enough shape from plate to mouth. Nor were the crusts quite as puffed, crispy or airy around the edges as last time. I wonder if there was too much pressure on speed and getting people through? Or had maybe lost some heat out of the oven? 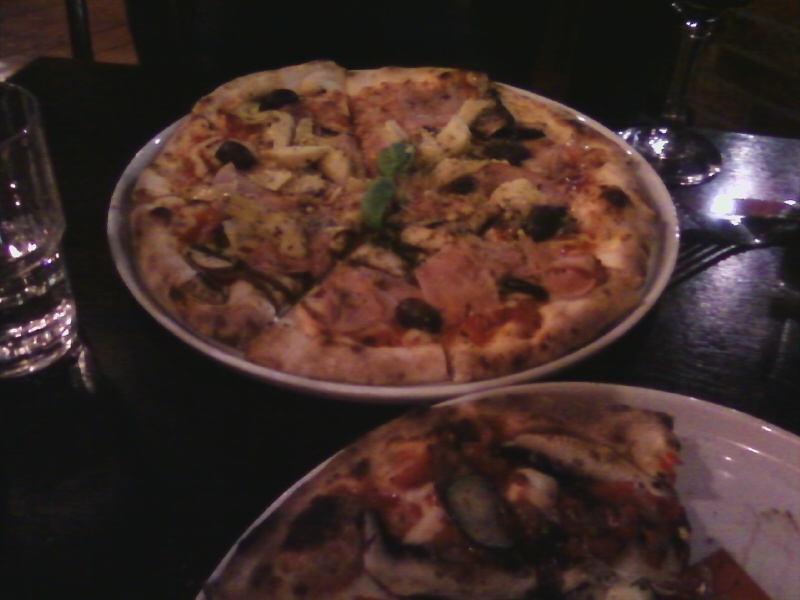 However, the flavours were good, the pizza’s non-greasy and the toppings suitably generous across all pieces. I will give them the benefit of the doubt at this point given the first experience was very good. Napoli is definitely worth a visit for a casual and convivial time, but do book as seating is limited. Or plan for your pizza to be takeaway.